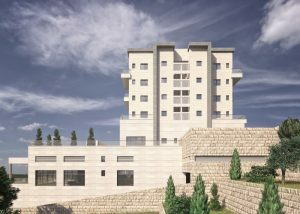 The project is located on Nahal Tse’elim across the street from the existing neighborhood of Ramat Shilo. Ramat Shilo is a great neighborhood, well known for its Shuls, Yeshivat Lev Hatorah and its close proximity to the major shopping center of Ramat Beit Shemesh Alef. Nofei Shilo also includes a small shopping center below the apartment buildings.